Mentors are trusted advisors who often show us, by example, how to do something new. When I was training to be a teacher, I learned the most from being in the classroom: observing teachers with real students, then giving it a go myself. My third graders tell me they learn how to make projects like glitter slime by watching other kids create it on Youtube. When we want to know how to do something, having a mentor to show us can make all the difference. Today, in writing workshop, we intentionally teach students how to write by using authors as our co-teachers. As teachers, we write for and with our students, and our writing can show them the possibilities for their own pieces. We highlight student work, too, as a mentor text, creating a bridge from what students are currently doing to a more effective way of writing. Our students become writing teachers alongside us and the published authors we study. We immerse our student writers in all these mentor texts in order for them to learn how to write well. 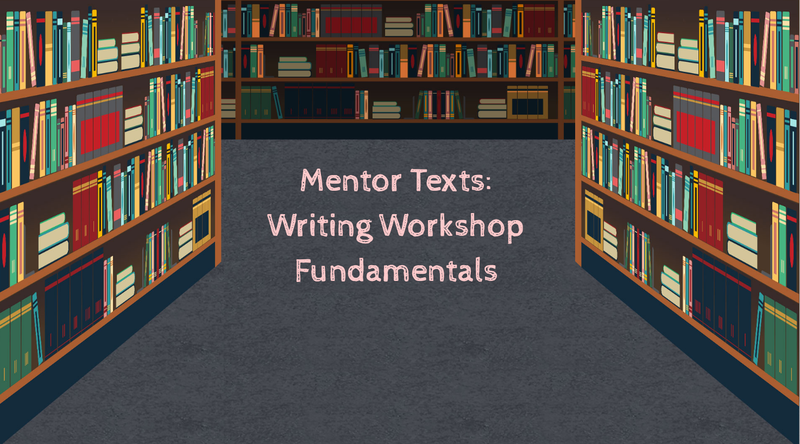 In Craft Moves, Stacey Shubitz (TWT’s Chief of Operations and Lead Writer) writes, “Mentor texts are samples of exemplary writing we can study during writing workshops…Mentor texts can be books, short stories, articles, letters and so on. Basically any text that can teach students how to write well can serve as a mentor text (3).” When students study a mentor text, they have already enjoyed it first as a reader — reading or listening to the piece read aloud. Once the text is familiar, it can be reread with the lens of reading like a writer: just how was the author able to put the words together in a way that stirred emotion, caught the reader’s attention or somehow changed your mind? Reading like a writer is the key to studying mentor texts. As a writer, you read to see patterns and notice how words are put together so you can try that in your own writing. Mentor texts can come from published authors, the teacher, or the students. Once you find your favorite authors, you can reread books with the lens of reading like a writer and thinking about how the author made the writing so striking. In Craft Moves, Stacey shares her process for mining picture books for writer’s craft to share with students. (https://twowritingteachers.org/2016/05/05/how-to-choose) The craft moves can be shared with students in a whole group session, small group session, or in a conference with one student. In my third grade classroom, I introduced the idea of writer’s craft and reading like a writer with Cynthia Rylant’s book In November. I read the book aloud to the students, and then on another day, we compared a bland paragraph about November with the picture book. Students worked in partnerships, rereading a typed-text version* of the book and finding places where the words were interesting or beautiful. We came back together to discuss the way Cynthia Rylant wrote the book, why we think she made those decisions as an author, and the effect it had on us as readers. I’ve found that students need to be taught that writers are making purposeful decisions when they write and we can find those craft moves in many different types of texts, from different authors. We can use those craft moves in our own writing as well; we can make decisions as the author, too. *It is important to obtain proper permission from the publisher before distributing copies of typed text. Published authors can be powerful co-teachers in our writing classroom, but there is also skillful instruction that can come from a teacher’s piece of writing, used as a mentor text. Teachers can share pieces of writing they’ve created outside of the classroom and also write in front of the students, creating a text that can be used as a mentor while students watch the process unfold. Whenever my class is about to start a new unit of study, I write a piece in that genre. It helps me to go through the process, to anticipate where they might face difficulty, to try it out for myself and work through the challenging parts. This piece of writing can be used as a mentor text for my students as we immerse ourselves in understanding the new genre. Once you have taught that genre, you can use the mentor text you created for the students each year. It can also be helpful for students to see the teacher craft a piece of writing in front of them. I often start a new piece once we are in the genre study, so they can see how I go about each step in the process and understand that the first writing you do often isn’t the way it looks by publication. Writers are constantly revising and rethinking and students need to see that modeled for them. 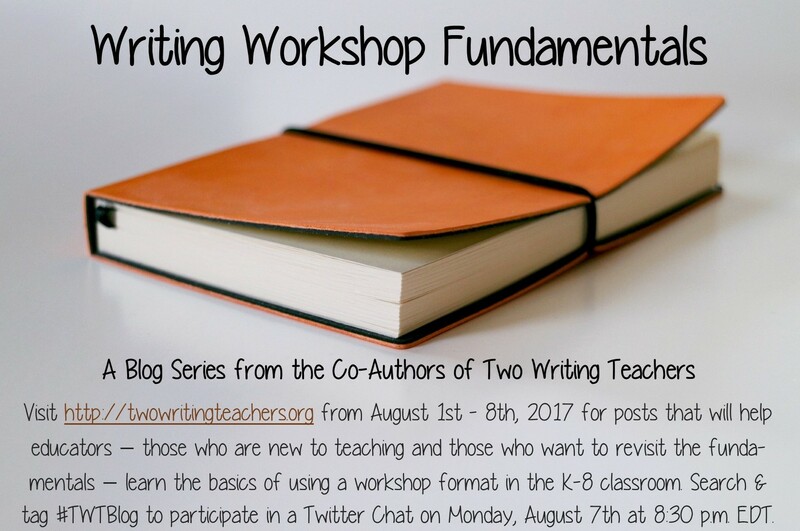 At Two Writing Teachers, one of our core beliefs is that teachers who teach writing should write themselves. Slice of Life blogging can also be shared as mentor texts and shows students that the teacher writes at other times than just in the classroom for demonstration lesson purposes. A couple of years ago, I wrote a post for the Nerdy Book Club. The day it was published, I was bursting with excitement to share it with my students. I brought in my typed copy with all the cross-outs and revisions, explaining to them how I asked for input from trusted friends before submitting it. Students need to see their teachers “ache with caring” (as Mem Fox would say) about the writing they put out into the world. We can act as writing mentors for our students when we make this process visible. If you are new to a grade level and do not have student mentor texts to draw from, you can always use student samples from other classes to share with your students. I have begun creating a bank of student samples that I can share with my current class. Each year, I hope to add to the student mentor text collection. When I’ve shared student writing as mentor texts, it has been so worthwhile for all of the students. The student writer usually beams with pride and grows in confidence and his peers see a mentor text that is often closer to what they themselves can write. It’s a bridge from a published writer’s work or even the teacher written mentor text. Student-written mentor texts should be part of your mentor text collection for any genre or skill you teach. Less is more. You don’t need to have a huge collection of mentor texts — just a few you know really well that touch upon the teaching points you want to make. For mentor texts from authors, start with your beloved picture books you’ve read and reread. Though the lens of a writer, reread to notice how the author crafted the piece. Think of the first piece of writing your students will do and write your own piece. Consider your process and make notes so you can share it with your students. Use different colored sticky notes for different parts of a story that mentors structure, development, or conventions. For example, yellow sticky notes would be placed in all the places that conventions are used to create voice. 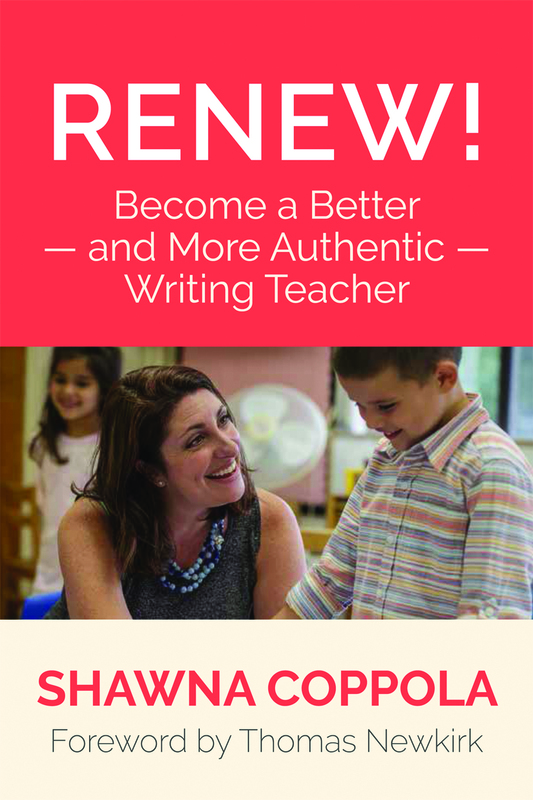 If you are the winner of the book, Beth will email you with the subject line of TWO WRITING TEACHERS – RENEW BOOK. Please respond to her e-mail with your mailing address within five days of receipt. Unfortunately, a new winner will be chosen if a response isn’t received within five days of the giveaway announcement. Mentor texts have been so helpful when working with young writers (K-2). Picture books are my go to for crafting ideas to share with the kids. They are helpful in my personal writing too. Great post for an overview before heading back to the classroom. I really value the idea of trying out the genre as a writer before you teach it so that you can anticipate the places where students might need extra support. In my experience, students love hearing my stories, and they love seeing that I am a writer, too. Thanks for the great post! I still have a lot of hesitation in my teaching of writing. Writing is amorphous and important and scary. This blog is a wonderful support. Thank you! I am a brand new teacher, 5th grade ELA. I love these blog posts, such great ideas! It makes teaching writing feel much more manageable for me now. Thank you, thank you, thank you! This reminded me of using student writing as mentor texts more often. In math, if you teach CGI, we have students share their different strategies to solve problems in class. Why not in writing? I will have my students share their writing moves that they have learned from authors and used in their own writing. I like your suggestion of using the same color sticky note for a similar skill and “less is more” is something I need to keep in mind as well! Mentor texts are so important in our classrooms – great reminders and information. Thank you, Kathy! I like your reminder that less is more sometimes. I think I drown my students in examples at times! This post reminded me of an awesome session on using mentor texts at ILA 2017. I hope that with practice I become more effective at using this strategy. This post pushed me to think about what we are naming as text and what it might and sometimes does mean to compose at school and in the world beyond schools. There are tensions between these places and mentor texts are sites of conflict at times. What mentor texts are digital? Non white? agendered? Game-based? Video? Hybrid? How might teachers move beyond essayist ideology when thinking about texts and autonomy ? A lot to consider .